Once a traditional country house attached to the bodega of one of the sherry families, the Hotel Villa Jerez is in an exclusive residential area 15 minutes from the city centre. 18 large rooms with oversized beds, traditional décor and generous bathrooms combined with spotless housekeeping, charming service, good food and plenty of local atmosphere add up to a memorable stay. Unbeatable location within walking distance of the bodegas, exhibition centre and famous dancing horses. Romantic getaways, culture bugs, foodie tourism and weddings. Singles, couples and small groups. Concierge 24 hrs. Spanish, English, Italian and some German and French spoken. Extensive gardens. Doctor on call 24 hrs (fees payable by client). WiFi in public areas, complimentary internet access and use, laptop computer available for use of clients. Hall lounge/reading room with fireplace. Showcase with fashion items for sale, details from reception. Daily laundry and pressing service 09:00-21:00, dry-cleaning service Mon-Fri 10:00-14:00 and 17:00-20:00. Evening turndown service in the room. Babysitter on request. AUTUMN-WINTER PROMOTION: Accommodation for 2 with breakfast included, basket of fruit in the room on arrival. Complimentary access to the gym, steam bath and Scottish shower. National newspaper. Late check-out (on availability). From USD 176.23/128.40 euros in Double Superior Room, USD 158.61/115.56 euros in single room; USD 294/214 euros in Junior Suite, VAT included, on availability. ROMANTIC GETAWAY: Accommodation for 2 persons in Double Superior Room with hydromassage bath, buffet breakfast for 2 included. Chocolates and cava in room on arrival. Dinner by candlelight for 2, with glass of wine and water included. Complimentary access to steam bath and Scottish shower. National press. Parking gratis. Late check-out (on availability). Offer valid from Monday to Sunday. GOLF IN JEREZ: Accommodation for 2 persons in Superior Double Room with buffet breakfast for 2 included. Green fee for 2 persons at the Sherry Golf Course, tee-off time on availability, reservation recommended. Complimentary access to Scottish shower and steam bath. Parking gratis. USD 241.66/176 euros per room and per night, VAT included. GASTRONOMIC STAY: Accommodation for 2 persons in Superior Double Room with buffet breakfast for 2 included. Basket of fruit or chocolates (depending on the season) in room on arrival. Dinner: tasting menu for 2 persons, drinks not included. Complimentary access to the Scottish shower and steam bath. Parking gratis. From USD 256.69/187 euros per room and per night, VAT included. The18 rooms and Junior Suites are individually decorated in classic beige tones in keeping with the original manor house. All have garden or pool views and a window (ground floor rooms) or terrace or balcony (first floor rooms). Oversized electronically-adjustable beds. Generous bathrooms with hydromassage baths, separate power showers, hairdryer. Satellite TV, radio, direct telephone in room and bathroom, internet connection, in-room safety deposit box and minibar. Individually controlled a/c and heating. Trouser press, dressing-gowns and slippers for use of client during stay. Communicating rooms, smoking/non-smoking rooms, rooms specially adapted for the use of disabled guests. Cots free. No charge for children up to 12 yrs old. Extra adult guest in room: tariff rate less 55%. Max cots/extra beds permitted: 1 in Double Superior rooms and 2 in Junior Suites. In addition to the Double Superior Room, the Junior Suites have a comfortable sitting room. Automatic upgrade to a superior room category on arrival (subject to availability). Bottle of mineral water in your room on arrival. 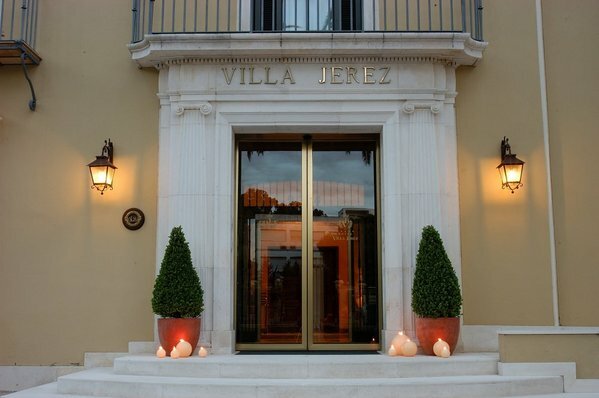 The Hotel Villa Jerez can exchange foreign currency. Credit cards accepted: Visa, MasterCard, Maestro, American Express, Diners. No charge for cancellations made more than 24 hrs before arrival. Cancellations made less than 24 hrs before arrival in low season will attract a charge of one night´s stay. Individual cancellation policies may apply in high season and during the Feria de Jerez (2-9 May 2010), the Grand Prix Motorcycle Championship (30 April-2 May 2010) and Golf Championships. LAS YUCAS: Intimate restaurant with an attractive porch, ideal for summer evenings. Enticing dishes from the traditional Spanish and international cuisines. Open daily 08:00-11:00 for buffet breakfast with variety of hot and cold dishes, 13:30-16:15 for lunch, 20:30-23:15 for dinner. HOTEL VILLA JEREZ SPECIAL RICE DISHES 15-28 Feb: The Hotel Villa Jerez is famous for its rice dishes. During two weeks in February a gastronomic menu of 10 rice dishes is available, min 2 persons, USD 16.47/12 euros per person. POOL TERRACE: Popular for informal breakfast, lunch and dinner in summer under its cool awnings. Restaurant menu. BAR: Open daily 08:00-24:00. Snack menu. ROOM SERVICE: 24 hr service. Hot meals served 08:00-23:00, cold meals 23:00-08:00. SALÓN JACARANDA: Reception room max capacity 80 persons seated theatre style for a meeting, or max 60 persons seated for lunch or dinner. SALÓN CIPRÉS: Boardroom/small meeting room max capacity 20 persons. Audiovisual facilities. GARDENS 4,000 m2: Intimate and elegant setting for a civil wedding ceremony or reception for 200 persons standing or 150 seated. Can be used in conjunction with Salón Jacaranda. Choice of 8 wedding menus. Lovely backgrounds for photographs. BUSINESS CENTRE: Independent new facility for business meetings in the gardens; equipped with modern audiovisual facilities, max capacity 60 persons. Direct access to the gardens and covered terrace for coffee breaks during meetings. THERMAL STEAM BATH: Ask at reception for instructions on use. Use gratis for hotel clients. SCOTTISH SHOWER: Alternating hot and cold water massage which relaxes the body; popular with clients. No fixed opening hours. Use gratis for hotel clients. MASSAGES: By appointment. HAIR and BEAUTY TREATMENTS: By appointment, ask at reception. The hotel Villa Jerez has designated rooms for smokers. No smoking in public areas inside the hotel. Pets are not allowed in the Hotel Villa Jerez. The Hotel Villa Jerez is situated in lovely grounds in a quiet and exclusive residential area 2 km from the town centre, and within 15 minutes´ walk of the Royal Andalusian School of Equestrian Art, the González Byass and Domecq cellars and the Exhibition Centre (Recinto Ferial). Private transport from the airport/station arranged by the Hotel Villa Jerez on request. Secure semi-covered 24-hr parking gratis. Taxi from the airport USD 20.59/15 euros. Taxi from the hotel to the town centre, USD 4.12/3 euros. JEREZ AIRPORT: 13 km/20 mins. SEVILLE AIRPORT: 107 km/1 hr 20 mins. GIBRALTAR AIRPORT: 111 km/1 hr 30 mins by the A-381; 145 km/2 hrs 16 mins by other routes. When departure is from Gibraltar, add l hr to your journey time to compensate for possible traffic holdups. FARO AIRPORT (Portugal): 288 km/2 hrs. 51 mins. ESTACION JEREZ DE LA FRONTERA: 2.3 km/5 mins. The Villa Jerez concierge will advise on/organise excursions. IN TOWN: González-Byass sherry bodega (1.1 km/3 mins by car, 13 mins on foot); Domecq sherry bodega (2,4 km/6 mins by car, 28 mins on foot); the horse show at the Royal Andalusian School of Equestrian Art (1.2 km/3 mins by car, 14 mins by foot); an authentic flamenco show. OUT OF TOWN: To the Costa de la Luz 13 km: Dolphin and whale-watching in the Bay of Cadiz; birdwatching in Coto Doñana, Seville, Cadiz, Sanlúcar de Barrameda. SPECIAL DATES 2010: Carnival: 12/02-20/02. Holy Week Processions: 28/03-04/04. Grand Prix Motorcycle championship 30/04-02/05. Jerez Horse Fair: 02/05-09/05. Wine Harvest Festival: 04/09-19/09.